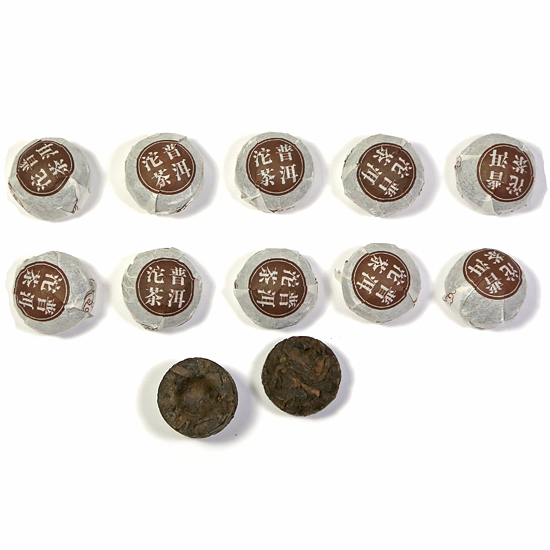 While most mini tuo chas are made from finely chopped low grade leaf and are astringent and unpleasant in the cup, these tuos are made from Mengku tea harvesting area 3rd grade leaf, and are creamy, sweet and very delicious. They are clean and bright in flavor, and really deliver a full and rich taste – the proof is in the cup. The aging and storage of these mini tuos has dissipated any excess wo dui taste and aroma, leaving this tea with a nice woodsy, earthy taste. These are the nicest tuo chas we have ever had – and we have recently been able to secure another batch of these from the same aged vintage. Keep a few of these in your pocket to share with an interesting stranger that you meet.